Last year, Cemetech made a strong showing at World Maker Faire, held the last weekend of September in Queens, New York. We first announced that we'd be presenting our work at the Faire in mid-September, and over the following two weeks, I planned the exhibits. Last year, I (administrator Christopher "Kerm Martian" Mitchell) was the primary presenter, assisted by Cemetech member Alec "qazz42" Szigeti and Sara "mreksm". The title of our booth was "Hacking Graphing Calculators", although the focus of our discussions with visitors bridged the three symbotic areas of learning programming via calculators, learning hardware hacking via calculators, and the history of graphing calculator hacking. 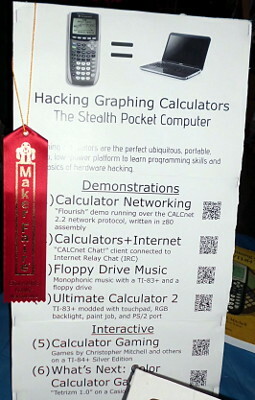 It was a fun and tiring weekend; we were awarded the Educators' Choice Award at the Faire, and I was interviewed by Hackaday about the state of the art of graphing calculator programming and hacking. This year, we'll be returning to World Maker Faire 2013. With less than two weeks left until setup, there is a lot to do. We need to design brochures or handouts (last year we had bookmarks with information about Cemetech and about "Programming the TI-83 Plus/TI-84 Plus"), we need to figure out what we'll be displaying, and we need to coordinate what we want people to take away about the community. In a very real sense, the Faire gives us the opportunity to be community ambassadors to thousands of young adults (and parents), and I think it's a good opportunity to open more students' minds to the value of learning programming with their graphing calculators. Please help us figure out what to show and talk about at the Faire in the attached thread. Elfprince13, geekboy1101, qazz42, and Mreksm will all be coming this year to help out, and I look forward to their help with ideas and execution. 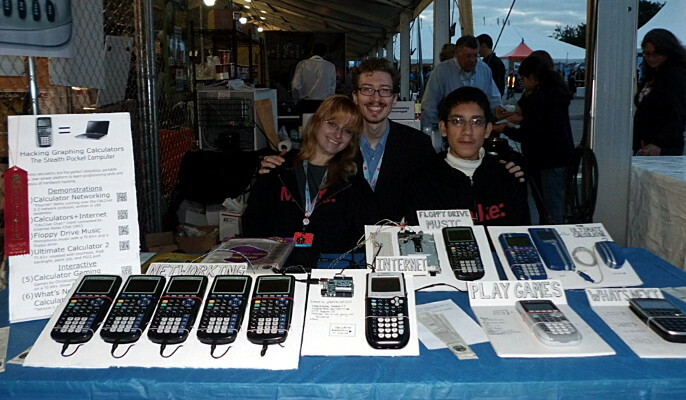 And of course, if you're in the New York area, be sure to come to Maker Faire, September 21-22, 2013 at the Hall of Science in Queens, and say hello! I am quite glad of it, and wish you all success. And I wish I could go. Darn I wish that World Maker Faire would have been in late July. What is on the cards for this year so far? I don't know if there is anything remotely like this in the UK and certainly not in my area : it's just not cool here...In fact it would be akin to admitting to owning a Betamax video recorder...sad really. I wish you all the best and could not think of a better ambassador for the technology. Good luck! Here is an idea, advertise your books so kids know that they can also come here for help with math homework dealing with the calculator. I'm sure some kids, and even teachers, have problems with the calculator and getting the right inputs to show the class. I really wish I could come. Good look Kerm and others going with. So far, the same stuff as last year: calculators showing off various projects, mounted on foamcore board, with a few calculators that people can try. Last year we had a TI-84+SE and a Casio Prizm for people to try; this year I'm thinking Prizm, TI-84+SE, and TI-84+CSE. Although the TI-Nspire and HP Prime are great math calculators, they're both not as applicable to the programming/hacking message we're trying to get across. Perhaps they can be on a separate board illustrating the difference between eminently programmable/hackable devices, especially those that students of all backgrounds can work with without needing a computer or any extra hardware, and devices that don't fit as well into that use case. Also, based on our experiences last year, the interactive calculators need to be attached down to the table somehow. I had them tethered only by power cabling, and little kids tended to pull them off the table to play games on them. In response to krazylego's suggestion, we're not allowed to explicitly sell things, but like last year, I will definitely mention the books and Cemetech in the category of "ways to get started with calculator math/programming". Kerm. Simply wonderful, I hope the evangelism of ti calculator programming goes well. I remember when you were at the fair and you told everyone that you won the Educator's Choice Award on IRC. ti83head. Britain does have maker faire's albeit very few indeed, which is a great shame. lucky are those who get to go and see your exhibit. I wish you the best of luck with your presentation this year. Being far away, I'm looking forward to at least seeing pictures of Cemetech's booth at this year's Maker Faire. I wish you all the best. I really hope the Prizm will be there for people to look at and try out; out of all the color-screen graphing calculators, I believe it is the one that is most hacker-friendly, because we know a lot about it and because so far Casio has been nice *cough* not locking up things *cough* *cough*. To people in need of a graphic calc for school, I think it is also the one that's most easier to get started with - but this is a matter of personal preference. Out of curiosity, what software will the calculators have available for demonstration (and what software did they have last year)? Oh boy, almost missed this topic if it wasn't for Kerm. Kerm I wasn't saying sell books, I was just saying have a copy out of each book so they can look and see the books, they just have to buy the book at a store. It would give people a chance to see what can be done with the calculators. Yes, it was a hit last year (being the only color-screen calculator we were showing), and we definitely plan to have it again this year. For this year, I need my crew here to help me figure it out. Last year we had a few of the most popular TI games running on a TI-84+SE (Doom, ZTris, Fruit Ninja, Invalid Tangram, Paper Plane, and so on), CALCnet on five calculators, globalCALCnet / Chat! on one calculator with an Arduino, and all the available Prizm C games on the Prizm. Any feedback and/or things you'd like to bring/suggest for the display? I hope we do too. I also want to try to get a rough sense of how many people tell us they just bought the TI-84 Plus C Silver Edition. How about you on the display suggestions and comments? Beyond that, not really sure what else to offer. Maybe take the Orion calculator and HP Prime to show off? Just make sure to keep a very very close eye on those items. Good plan. I'm thinking of mounting the Orion, Prime, and Nspire CX separately, as examples of calculators that are interesting/unique/not ones we ordinarily program as much. Well, yeah, that's what I figured you would want to do. Give those some advertising, even if the Orion isn't something that will see a lot of purchases. Oh yes, this will be a crucial part of the visit, as I'm getting tired of having issues with my 89 T where I might not know how to do something during an important assignment or it not being allowed on tests (my physics AP (or was it the reagents... ) went a little wonkey thanks to this as I was forced to use a scientific calculator ;. Kerm, do you possibly know if I can aquire a raspberry pi at maker's faire? Online shopping is a bit of a hassle for me, and I haven't seen a place selling them around here, so it'd be great if I could pick one up on hand at the faire. There are 256 users online: 14 members and 242 guests. © Copyright 2000-2019 Cemetech & Christopher Mitchell :: Page Execution Time: 0.323273 seconds.